Rediff.com » Business » Buying property from an NRI? IMPORTANT tax tips! Both NRIs and those who make payouts on sale of property need to understand the TDS provisions that are applicable or risk punishment, warns Sanjay Kumar Singh. The income tax department says it will focus on tax deducted at source, especially in the case of sale of property by non-resident Indians, according to media reports. Both NRIs and those who make payouts to them need to understand the TDS provisions that are applicable or risk punishment. Any payment to an NRI which is chargeable to tax in India is subject to TDS, according to Section 195 of the I-T Act. Says Suresh Surana, founder, RSM Astute Consulting Group: "The rationale for applying TDS on NRIs' income is better tax administration, the same as in the case of residents." The TDS rules are, however, a little more stringent for NRIs. In the case of bank deposits, for instance, the TDS rate applicable to interest on a non-resident ordinary account is 30 per cent, whereas in the case of residents it is 10 per cent. In the case of residents, surcharge and cess are not deducted while making non-salary payments. But, in the case of payments to NRIs surcharge and cess have to be levied, which increases the effective TDS rates. India has entered into Double Tax Avoidance Agreements with several countries. "Of DTAA and the provisions of the Indian I-T Act, whichever is more beneficial to the taxpayer will apply," says Archit Gupta, founder and chief executive officer, ClearTax. In the case of certain treaties, a lower withholding tax rate is prescribed on interest income. NRIs in those countries may avail of the lower rate, provided they have a valid tax residency certificate. An NRI who is resident in the United Arab Emirates may, for instance, benefit from a concessional tax rate of 12.5 per cent on interest income in India, informs Surana. 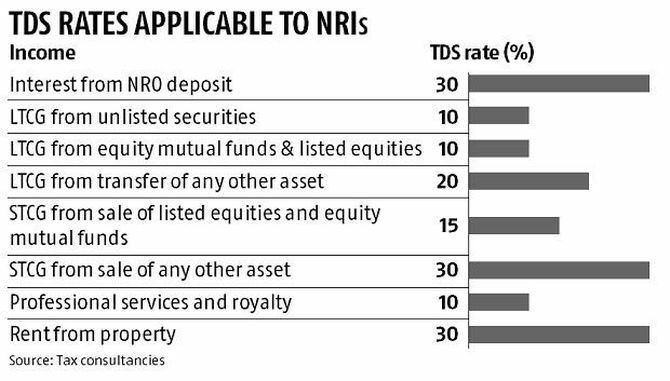 In the case of sale of property by an NRI (see table for rates), TDS has to be deducted by the purchaser. Tax should be deducted only on capital gains and not on the sale price. "The NRI should approach the jurisdictional assessing officer under Section 197 and make an application for obtaining the lower withholding tax certificate," says Surana. The assessing officer will decide the proportion of the sale amount on which tax is to be deducted and issue a certificate within 30 days. Once this is furnished to the buyer, the latter will deduct tax at the lower rate and deposit it with the government. The credit for such tax deducted can be claimed by the NRI while filing his return in India. In the case of rent paid to an NRI, the tenant has to deduct TDS at 30 per cent and remit it to the government. The tenant must fill Form 15CA at the time of making payment. "Form 15CA is a form for remittance filed by the person deducting TDS. In the case of certain payments, it becomes mandatory to obtain Form 15CB from a chartered accountant, too, besides filing 15CA," says Gupta. Form 15CB is not required when the remittance does not exceed Rs 500,000 and does not require the Reserve Bank's approval. Form 15CB is a certificate in which details of payment, TDS rate, deduction and other details of the nature and purpose of the remittance are verified by a chartered accountant. 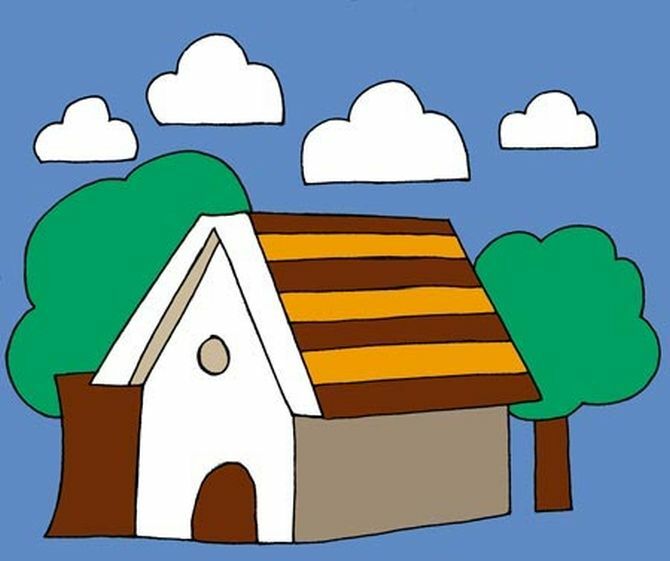 The buyer of the immovable property should possess a tax deduction account number. TDS must be deposited on or before the seventh of the month immediately succeeding the month of deduction. It may be deposited online, using challan number ITNS/281 through the NSDL portal.